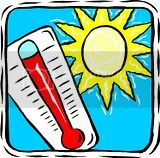 Secretary of Labor Hilda Solis on April 26 announced a national outreach initiative by the Occupational Safety and Health Administration (OSHA) to educate workers and their employers about the hazards of working outdoors in the heat and steps needed to prevent heat-related illnesses. "If you're working outdoors, you're at risk for heat-related illnesses that can cause serious medical problems and even death," said Secretary Solis. "But heat illness can be prevented," she said. "This Labor Department campaign will reach across the country with a very simple message - water, rest and shade."